This chapter builds on James Gee’s (2003) description of the playing of computer games as the learning of a new literacy. To investigate this form of literacy learning from a player’s perspective, the author created an avatar and joined the online community of the Massively Multiplayer Online Game, the World of WarcraftTM produced by Blizzard Entertainment®. This autoethnographic approach to exploring the game’s linguistic, visual, audio, spatial and gestural elements of design provide an insider’s perspective of the meaning-making resources that were on offer. 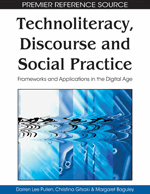 The chapter concludes with a tentative consideration of how understandings about the literacies used within a virtual world might inform the learning of literacies in schools and other educational institutions. It is widely recognised that computer games have become a major form of entertainment for many young people. In fact, recent reports by GfK Australia (2008a) and the media (e.g. “Games consoles wrap up boom festive season,” 2008) indicated that 175,000 Sony PlayStations were sold in Australia in the five weeks prior to Christmas in 2007 and that sales of the Nintendo DS and the Nintendo Wii were also in the tens of thousands during that period. At the end of 2008, GfK Australia (2008b) reported that sales of games consoles had continued to increase with “double digit revenue growth in 2008” (p. 2). Because this suggests that digital technologies play a substantial role in the entertainment practices of so many young people, it is imperative that educators learn more about the practices that young people are using in their out-of-school lives and consider how these might inform school or other forms of institutional learning. Views about the value of computer games, which are played on a range of technological devices including computers, games consoles and even mobile telephones, are diverse and have been conceptualised broadly as “a harmless diversion at best, a vile corruptor of youth at worst” (Brown & Thomas, 2006). Negative views surface regularly, especially in relation to apparent links between violence in computer games and aggressive behaviours (e.g. “Violent games make users more aggressive,” 2006). Indeed, if we go back to the 1980s, the US Surgeon General announced that games were among the top health risks facing American citizens (see Squire, 2002). Such negative perceptions seem to originate in commonsense understandings that game-playing, even if not harmful to mental health, is a waste of time and is contributing to a population of socially disinterested, sedentary and obese young people. At the other end of the spectrum are positive stories about computer games. Many of these have focused on the experiences and skills that may be transferred from the virtual world to the ‘real’ world. For example, there is the regularly cited example of Stephen Gillett, who apparently drew on his experiences as a guild leader in the computer game World of WarcraftTM as an important qualification to ‘win’ the position of senior director of engineering operations at Yahoo!® (Brown & Thomas, 2006; Prensky, 2006). Another widely publicised example involves reports that surgeons who engage in digital game playing are much better in simulations of keyhole surgery than those who do not (“Nurse, hand me the latest video game,” 2007; Prensky, 2006). As Steinkuehler (2006) pointed out, the media tends “to greet every new technology with stories of salvation or damnation (and relatively little between)” (p. 50). Whilst positive examples are sometimes dismissed as media hype or exaggeration, there is a developing body of work that highlights the literacy practices of computer games (e.g. Gee, 2003, 2004; Martin & Murray, 2006; McClay, Mackey, Carbonaro, Szafron, & Schaeffer, 2007; Steinkuehler, 2004). Gee (2003) argues that learning to play a computer game is “learning a new literacy” (p. 13) and that games draw on successful learning principles and provide considerable evidence about how learning might be enhanced in contexts such as schools. In Gee’s (2004) opinion, young people’s exposure to the language and symbols of digital technologies means that they are engaged with compelling and motivating learning that may draw on different forms of thinking, interacting, and valuing from those usually promoted by schools.